The Halo 3: ODST Official Strategy Guide is the official Prima Strategy Guide to the Halo 3: ODST video game. Move Out Soldier - Complete coverage of the single player missions, with labeled maps for New Mombasa and tactics included for the Legendary level of difficulty. Team Up - Intense Co-Op strategy to ensure you and your squadmates survive, with input from the actual developers and testers to give you the inside track. Clan Wisdom - All Halo 3 multiplayer maps with breakdowns and tips from some of the best clan players in the Halo Nation. Rise Through the Ranks - Detailed info on every Achievement from Halo 3: ODST and Halo 3. More than a list, it contains instructions and tips for every achievement. 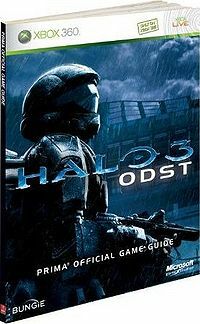 On the advertisement for the Halo Encyclopedia, "Halo 3: ODST" is printed as "Halo3OSDT". On the page describing the vehicles, the Banshee section states that an ODST cannot operate it, when it actually can be piloted in Kikowani Station. This strategy guide is the second shortest, after the Halo Wars: Official Strategy Guide, which is 208 pages long, and equal length as the Halo 3: The Official Strategy Guide, 209 pages also.